New laws were signed related to California’s Paid Family Leave (PFL) Program and Lactation Accommodation. SB1123 will allow employees to collect PFL benefits beginning January 1, 2021, if it they take time off for activities related to the covered active duty status of their spouse, registered domestic partner, child or parent who is a member of the U.S. Armed Forces. Called “qualifying exigencies,” these activities include such things as official military ceremonies; briefings; changes to child care/financial/legal arrangements as a result of military service; counseling; or spending time with the covered service member during rest and recuperation leave, among others. While PFL itself does not provide a leave, the Federal Family and Medical Leave Act (FMLA) provides up to 12 weeks of protected leave for qualifying exigencies. California employers currently must provide a private location in close proximity to the employee’s work area, other than a toilet stall, for the employee to express breast milk. AB1976 brings California Law into conformity with federal law by requiring that the employer provide a location other than a “bathroom,” rather than a toilet stall. The new law will provide an undue hardship exemption under limited circumstances. New laws provide clarity about last year’s salary history ban and tighten up rules on considering convictions and hiring decisions. The pay scale provided only needs to include salary or hourly wage ranges. In addition, compensation decisions based on a current employee’s existing salary, such as for giving raises or bonuses, will be permissible if justified by factors such as seniority or merit system. Current law generally prohibits consideration of an applicant’s judicially sealed or expunged convictions. SB1412 will narrow an employer’s ability to consider sealed or expunged convictions to only those circumstances where a particular conviction would legally prohibit someone from holding that job. Several new laws focused on increasing harassment and discrimination protections for 2019. An employer will now be permitted to reveal in a job reference whether an individual is not eligible for rehire because the employer determined that he/she engaged in sexual harassment. SBH20 will prohibit any settlement agreement in a case where sexual harassment, assault or discrimination has been alleged from including a confidentially provision that prohibits disclosure of factual information regarding the claim, except with regard to the claimant’s identity. Sign a non-disparagement agreement preventing the employee from disclosing information about unlawful acts in the workplace, including but not limited to sexual harassment. These prohibitions won’t apply to negotiated settlement agreement or severance agreement. SB1300 will also expand employer liability for unlawful harassment by non-employees and prohibit a prevailing defendant from being awarded attorney’s fees and costs unless specific factors are proven. Current law requires employers with 50 or more employees to provide supervisors with two hours of sexual harassment training. Under SB1343, by January 1, 2020, all employers with five or more employees will be required to provide two hours of sexual harassment training to supervisors and one hour to non-supervisor employees within six months of hire or promotion, and every two years after that. Temporary and seasonal employees will be required to be trained within 30 days of hire or 100 hours worked, whichever is earlier. Under AB3109, any provision in the contract or settlement agreement will be deemed unenforceable if it prohibits testimony about criminal conduct or sexual harassment in an administrative, legislative or judicial proceeding. AB3109 covers only testimony that is required, such as by subpoena or court order, or in response to a written request in an administrative or legislative hearing. Any publicly held corporation with principal executive offices in California will be required to place at least one female director on its board by December 31, 2019. Depending on the board size, up to 3 female members may be required by the end of 2021. Significant financial penalties apply if a company fails to achieve the required number of female directors. Under AB 2338, talent agencies will need to provide their adult artists with educational materials on sexual harassment prevention, retaliation and reporting resources as well as on nutrition and eating disorders. All materials must be provided within 90 days in a language the artist understands. Artists who are between the ages of 14 and 17, along with their parent or legal guardian, will need to receive and complete training in sexual harassment prevention, retaliation and reporting resources before they are issued a work permit. The new law imposes penalties and record keeping requirements. Talent agencies will be required to confirm to the Labor commissioner, as a part of their licensed renewal process, that they are providing the relevant educational materials. Current California Law imposes liability for sexual harassment that occurs in the course of a business, service or professional relationship. Examples include doctors, attorneys, bankers and accountants, among others. SB224 extends the list to elected officials, lobbyists, investors, directors and producers, and anyone who holds himself/herself out as being able to help someone establish a business, service or professional relationship. On January 1, 2019, California’s State minimum wage increased to $11.00 per hour for employers with 25 or fewer employees and to $12.00 per hour for employers with 26 or more employees. This is not a new law - SB3 was signed in 2016, and this is the next mandatory increase. Also, on January 1st, agricultural employers under Wage Order 14 with 26 or more employees will see the first in a series of phase-in overtime changes. The agricultural workers, who have historically received time and a half only after 10 hours per day or 60 per week, will now receive it after 9.5 hours per day or 55 hours per week. Agricultural employers with 25 or fewer employees remain covered by the old rules for now, but will begin phase-in overtime changes in 2022. These new requirements are a result of AB1066, signed into law two years ago. In addition, a few narrow industry wage and hour carve-outs were created this year. Construction industry employees will be prohibited from pursuing a Private Attorney’s General Act (PAGA) claim under AB1654 where the worker is covered by a Collective Bargaining Agreement (CBA). To qualify for the exemption, the CBA must include a grievance and binding arbitration procedure to address potential Labor Code violations. The new law will remain in effect until January 1, 2028. The recent court ruling of Augustus v. ABM Security Services, Inc. (2016) 2 Cal.5th 257 hinders employer’s ability to reach employees even in emergency situations because the court determined that employees could not be required to carry instant communication devices during breaks. AB2605 created an extremely limited exception for required rest breaks in the petroleum industry, allowing employers to require that employees holding safety sensitive positions at petroleum facilities be on-call and carry instant communication devices during rest breaks. Employers must be able to make up the missed break or receive a rest break penalty of one hour’s pay. This exception applies only at petroleum facilities covered under Wage Order 1 - Manufacturing, and took effect immediately upon being signed by Governor Brown on September 20, 2018. AB2610 created an extremely limited meal break exception for certain commercial drivers, who are transporting commercial feed to customers in remote, rural areas. These drivers will be excluded from the obligation to provide a meal break within the required time period if the driver receives no less than one and one-half times the State minimum wage and overtime compensation when required by law. Existing law allows employees to “inspect or copy” their payroll records. SB1252 merely makes clarifying changes designed to ensure that employers make and provide the copies rather than requiring that employees find ways to make the copies themselves. Employers’ liability for workplace injury reporting violation penalties will be extended from six months to five years under AB 2334. A change in the code’s definition of an “occurrence” as it relates only to citations for record keeping purposes means citations may be issued for the entire five-year mandatory record retention period until they are corrected or discovered by the California Division of Occupational Safety and Health (CAL/OSHA), or until any record-keeping duty is eliminated. If Federal OSHA follows through with its current proposal to eliminate or substantially diminish electronic submission requirements for logs 300 and 301, AB 2334 directs CAL/OSHA to create an advisory panel to consider how California employers could still be required to continue electronic submission. Two new laws related to imposing joint liability were signed this year. Joint liability will be imposed on client employers who hire port drayage motor carriers (trucking companies) with certain unpaid employment-related judgements, affecting businesses such as retailers, agriculture and auto dealers who rely on port truckers to transport products from ships. Port trucking companies will be placed on a Division of Labor Standards Enforcement website “blacklist” if they have an unsatisfied final judgment for taxes, various wage and hour violations, unreimbursed expenses, failure to provide workers’ compensation coverage, or independent contractor misclassification. A customer that uses a port trucking company on the blacklist will share all civil legal responsibility and civil liability for services obtained after the date the trucking company appeared on the list. For certain private construction contracts, last year’s AB 1701 imposed liability onto the general contractor for any unpaid wages, benefits or contributions that a said contractor owes to a worker under the contract. This year’s Cleanup Bill, AB 1565, removes the provision placed into the Labor Code by AB 1701 that indicated a direct contractors’ liability for unpaid wages or benefits is an addition to any obligations and remedies otherwise provided by law and makes other clarifying changes. AB 1565 is an urgency measure that took effect upon being signed by Governor Brown on September 19, 2018. Current law requires that certain types of businesses post human trafficking notices containing hotline numbers to seek help or to report unlawful activity, and information about organizations that provide services to eliminate slavery and human trafficking. AB 2034 will require that by January 1, 2021, employees of Intercity Passenger Rails, light rails and bus stations who might interact or come into contact with a victim of human trafficking –or are likely to receive a report from another employee of suspected human trafficking – attend the training session of at least 20 minutes on recognizing and reporting suspected human trafficking. SB 970 requires that by January 1, 2020, certain hotel and motel employees participate in ongoing training to identify, respond to and report human trafficking. At least 20 minutes of classroom or other interactive training must be provided to any hotel or motel employee who is likely to interact or come into contact with victims of human trafficking, including those who worked in a reception area, perform housekeeping duties, help customers in moving their possessions or drive customers. One of the Supreme Court decisions with the most significant impact on California employers in 2018 is the decision in Dynamex Operations v. Superior Court, 4 Cal.5th 903 (2018), where the Supreme Court announced its mission to target businesses that misclassify employees as independent contractors in order to derive an unfair competitive advantage over other businesses that comply with the law. The Supreme Court emphasized that the hiring entity must establish the existence of each of the three parts of the ABC test. If the entity fails in its burden to prove any one of the three elements, it will be sufficient to establish that the worker is covered by the Wage Order as an employee. In October 2018, the California Court of Appeal applied and interpreted Dynamex in Garcia v. Border Transportation Group, LLC, 4 Cal.5th 903 (2018). The plaintiff taxi cab driver filed a lawsuit against Border Transportation Group (“BTG”). Garcia’s claims were in-part based on Wage Order 9, as well as labor code violations that were non-Wage Order claims. Garcia appealed the trial court ruling that he was properly classified as an independent contractor. The appellate court reversed applying Dynamex. Specifically, the court determined BTG failed to meet its burden under part C of the “ABC Test”, to demonstrate that Garcia “is customarily engaged in an independently established trade, occupation, or business”. The court specified that it was insufficient to merely show that Garcia was capable of such engagement, but that he did so, in fact. The Court’s handling of the non-Wage Order claims clarified the Dynamex holding. The court of appeals held that Dynamex does not apply to non-Wage Order claims. Instead, the standard that applied to those claims (such as wrongful termination, reimbursements, etc.) was the common law standard in S.G. Borello and Sons, Inc. v. Department of Industrial Relations, 48Cal.3rd 341. The Garcia decision draws a clear distinction between Wage Order and non-Wage Order claims, indicating that the Dynamex standard (the ABC Test) applies to Wage Order claims while the Borello standard applies the non-Wage Order claims. Dynamex retroactivity, although currently undecided by the 9th circuit in Lawson v. Grubhub, will likely be determined by higher courts to be retroactive. Recent lower court holdings such as Oriana Johnson v. Imperial Showgirls (Orange County) show a leaning to apply Dynamex retroactively. In that case, the judge held that Dynamex, which had been going on for 13 years by the time the Supreme Court issued its landmark decision, was intended to apply retroactively because “it did not state that its decision applied only prospectively.” “Given the age of the claims in the Dynamex case, and given the court’s longstanding acknowledgment of its authority to make such a statement ... the lack of such a pronouncement suggests that the decision should apply retroactively,” Judge Claster wrote. “Although not necessarily determinative, the court’s later decision to deny requests to modify its decision to state that Dynamex will only be applied prospectively supports this conclusion”. Given the broad impact of Dynamex, employers should consult with their employment law specialists to ensure they are properly classifying independent contractors under the ABC test. In July 2018 Troester v. Starbucks Corp., the Supreme Court answered the question of whether the federal Fair Labor Standards Act’s (“FLSA”) de minimis doctrine apply to claims for unpaid wages under three provisions of the California Labor Code governing minimum wages and overtime. The Supreme Court first concluded that California labor laws and regulations have not adopted the de minimis doctrine. The Supreme Court implicitly disagreed with the state enforcement agency, the DLSE, which had adopted the federal standards in its enforcement manual and opinions. At issue in Troester, was a Plaintiff with store closing tasks he performed after clocking out. Plaintiff asserted after clocking out he would activate the alarm, exit the store, and lock the front door. He also submitted evidence that he was a shift supervisor and walked his co-workers to their cars in compliance with Starbucks’ policy. Starbucks moved for summary judgment on the ground that Troester’s uncompensated time was so minimal that Starbucks was not required to compensate him. “An employer that requires its employees to work minutes off the clock on a regular basis or as a regular feature of the job may not evade the obligation to compensate the employee for that time by invoking the de minimis doctrine. As the facts here demonstrate, a few minutes of work each day can add up. According to the Ninth Circuit, Troester is seeking payment for 12 hours and 50 minutes of compensable work over a 17-month period, which amounts to $102.67 at a wage of $8 per hour. That is enough to pay a utility bill, buy a week of groceries, or cover a month of bus fares. What Starbucks calls ‘de minimis’ is not de minimis at all to many ordinary people who work for hourly wages.”. The modification leaves open the possibility that instances will probably arise where the de minimis doctrine “that is a background principle of state law” should apply. In any event, employers should review the company processes to ensure employees are not engaging in off-the-clock work for small tasks on a regular basis. In Alvarado v. Dart Container Corporation of California, the California Supreme Court answers questions that will directly impact how employers calculate overtime in the future – and how they should have been calculating it all along. In short, the Court held that when calculating overtime in pay periods in which an employee earns a flat sum bonus, employers must divide the total compensation earned in a pay period by only the non-overtime hours worked by an employee. Alvarado filed a class action complaint against Dart in August 2012 for Dart’s alleged failure to provide overtime and several related derivative claims. The primary dispute was Dart’s calculation of employee overtime with respect to an attendance bonus paid to employees who worked on Saturdays and Sundays. In order to encourage attendance on unpopular work days, Dart paid employees an “attendance bonus” of $15 per day for employees who worked on a Saturday or Sunday and completed their full work shift. When calculating overtime, Dart used a four step process: (1) multiply the number of overtime hours by the employee’s straight time (called the “base” rate); (2) add the total hourly pay for non-overtime work, any non-hourly compensation, and the base hourly pay for overtime work from step one; (3) multiply the total from Step 2 with the overtime hours during the relevant pay period (called the “premium”); and (4) add the base rate from step one with the premium from step three to get the total overtime compensation for the pay period. Alvarado argued this method of calculation was unlawful, and that the regular rate of pay should be determined by allocating the attendance bonus only to non-overtime hours worked. The trial court granted Dart’s motion for summary judgment after concluding there was no valid California law or regulation on point, and relying on federal regulations allowing Dart’s calculation method. The court of appeal affirmed the trial court’s grant of summary judgment. The Supreme Court granted review to determine how a flat sum bonus should be factored into an employee’s regular rate of pay for purposes of calculating overtime. The Court described the issue before it as needing to determine if the divisor for purposes of calculating a per hour value of a bonus should be: (1) the number of hours the employee actually worked, including overtime; (2) the number of non-overtime hours worked; or 3) the number of non-overtime hours that exist in the pay period. The Court ultimately chose the second option and rejected Dart’s calculation method as unlawful. The Court reasoned that, because the flat sum bonus at issue was payable even if the employee worked no overtime during the relevant pay period, it should be treated as being earned during only the non-overtime hours in the pay period. Therefore, only non-overtime hours should be considered when calculating the bonuses’ per-hour value. Accordingly, the Court adopted a new test for calculating the regular rate with flat sum bonuses that requires employers to calculate the regular rate using only non-overtime hours worked during the pay period. Notably, the Court limited its decision to situations with flat-sum bonuses. Thus, production bonuses, piece rate bonuses, and many other bonuses will not be affected by this decision. Unfortunately, however, the Court’s decision will apply retroactively, and there will be significant consequences for employers following this decision. Because this decision is retroactive, employers should consult with their employment law specialist to audit their overtime calculation policies to ensure they are in compliance. In Huff v. Securitas Security Services USA, Inc., 23 Cal.App.5th 745 (2018), the court addressed the question of whether a plaintiff who brings a representative action under Private Attorney General Act (“PAGA”) may seek penalties Labor Code violation that did not affect him or her directly. The trial court determined Plaintiff not being personally affected by one of the many Labor Code violations alleged in his complaint did not prevent him from suing under PAGA. The court of appeal affirmed, concluding that PAGA allows an “aggrieved employee” -- a person affected by at least one Labor Code violation committed by an employer -- to pursue penalties for all the Labor Code violations committed by that employer. The court reasoned that a representative action under PAGA is not a class action with the associated mandates of a Plaintiff being directly impacted by a violation. Instead, it is a law enforcement action where the plaintiff acts on behalf of the Government, akin to a qui tam action. This ruling opens the door for plaintiff attorneys in California attempting PAGA actions to recruit representative employees that were not even directly impacted by all claimed labor code violation. In AHMC Healthcare, Inc. v. Superior Ct., 234 Cal. Rptr. 3d 804 (Ct. App. 2d Dist. 2018), the California Court of Appeals determined that timekeeping systems that round time do not violate California wage laws so long as the system does not systematically undercount employee time worked. Two hospital employee plaintiffs brought a class action, alleging that for them, individually, rounding resulted in a minimally lower hours total, and accordingly minimally lower compensation, as compared to their unrounded time. The parties agreed to a set of stipulated facts. These facts included an expert’s analysis of the time records of the class, including (1) the number of employees who benefitted from rounding vs. the number who lost time through rounding, (2) the total number of employee shifts in which time was rounded up vs. the total number of shifts in which it was rounded down, and (3) whether the overall benefit of the rounding went to the employees as a whole, or to the employer. On these facts, the trial court denied the hospital’s motion for summary adjudication. The California Court of Appeal reversed, finding that the rounding policy was lawful because the rounding policy resulted in almost equal percentages of employees gaining time vs. those losing time, and the overall impact of the rounding policy resulted in an increase of compensable hours as compared to non-rounded time. This decision reaffirms the rule that a rounding policy is lawful if it is facially neutral, consistently applied, and does not favor the employer to a significant degree. Additionally, rounding policies are not analyzed on an individual, employee-by-employee basis; a rounding policy may be lawful if it results in undercompensating an individual employee so long as it does not systematically undercompensate employees as a group. Further, a policy is not unlawful simply because a slight majority of employees end up having their time rounded down, as was the case here. This case confirms that a rounding system must be fundamentally unfair to employees for it to be unlawful. Nevertheless, employers that round to the nearest five minutes or one-tenth of an hour may be safer than those that round to the nearest fifteen minutes. Employers should periodically self-audit their rounding system to protect against potential lawsuits. In Nunies v. H.I.E. Holdings, Inc., 2018 D.J. 10597 (9th Cir. 2018), the Ninth Circuit Court of Appeals evaluated the ADA and the definition of disability under federal law. It determined that an amendment to the ADA in 2008 under the ADA redefined disability and the burden of proof standards. To set forth a prima facie disability discrimination claim, a plaintiff must establish that: (1) he or she is disabled within the meaning of the ADA; (2) he or she is able to perform the essential functions of the job with or without reasonable accommodation; and (3) the employee suffered an adverse employment action (e.g. termination) him or her because of the disability. A disability is defined as a person with a physical or mental impairment that substantially limits one or more major life activities. A person is considered to have a disability if either he has a record of such an impairment or is regarded as having such an impairment by his employer. An employee meets the requirement of “being regarded as having such an impairment” if the individual establishes that he or she has been subjected to an action prohibited because of an actual or perceived physical or mental impairment whether or not the impairment limits or is perceived to limit a major life activity. Notably, the ADAAA altered the relevant standard. Prior to the amendment, a plaintiff had to “provide evidence that the employer subjectively believed” that he or she was substantially limited in a major life activity. The Court held that the ADA excludes individuals from “regarded-as coverage” if the impairment is both transitory (i.e., expected to last six months or less) and minor (which the statute does not define) – but that it was the burden of the employer to prove this as a defense. The Ninth Circuit ruling, although evaluating a long existing amendment, will make it more difficult for employers to succeed on summary judgment motions under the ADA. Additionally, Courts often look to ADA rulings to evaluate California state FEHA disability cases. Although this case does not currently reflect California state law standards for “regarded-as”, it is expected this case will be used to argue in favor of Plaintiff’s in future cases. In this case, Plaintiff claimed that Digital Realty Trust, Inc. terminated his employment shortly after he reported to management claimed securities law violations by the company. He filed suit, alleging a claim of whistleblower retaliation under Dodd-Frank. Digital Realty moved to dismiss his claim on the ground that he did not alert the SEC prior to his termination. Both the district court and Ninth Circuit held that an employee does not need to alert the SEC to be cloaked with the protections of Dodd-Frank. The Supreme Court reversed, holding that in order for an employee to sue under Dodd-Frank’s anti-retaliation provision, a person must first provide information relating to a violation of the securities laws to the SEC. The California Fair Employment and Housing Act (“FEHA”) prohibits discrimination based on an individual’s disability. In Cornell v. Berkeley Tennis Club, 18 Cal.App.5th 908 (2018), the Plaintiff asserted, among other claims, that she was fired from a tennis club because she was disabled (obese). The trial court dismissed her disability claim finding obesity was not a disability under FEHA. Plaintiff challenged the trial court’s ruling on appeal arguing the employer failed to carry its initial burden of showing that she cannot demonstrate that her obesity constitutes a “physical disability” under the FEHA. The court of appeal agreed with Plaintiff’s contention that the Club had the initial burden of demonstrating that she cannot establish that her obesity has a physiological cause. This ruling makes it more difficult for employers to dispose of obesity-related claims on summary judgment absent some evidence that there is no physiological cause for the obesity, such as medical expert deposition testimony or an Independent Medical Examination of Plaintiff with such a conclusion. In Janus v. American Fed’n of State, County, and Mun. Employees, Council 31, 138 S. Ct. 2448 (2018), The U.S. Supreme Court overturned its prior rule from Abood v. Detroit Board of Education, 431 U.S. 209, 97 S. Ct. 1782 (1977), which permitted requiring non-union employees to pay fees, even though they are not union members. In Janus, the Court decided that the concerns underlying the Abood decision have since been proven unfounded. For example, the federal government and the twenty-eight right-to-work states do not allow such fees, yet millions of public employees are represented by unions that effectively serve as the exclusive representatives of all of the employees. The Court accordingly held that the concerns raised in Abood may be addressed, if necessary, through less restrictive means. This decision is directly applicable only to public sector unions, and results in a substantial impact to revenue streams of public sector unions, and may also result in a drop in membership now that agency fees are not required. In Camacho v. Target Corp., 24 Cal. App. 5th 291, 234 Cal. Rptr. 3d 223 (2018), the court of appeals determined that settlement of workers’ compensation claim which included addendum containing additional release resolving all claims between parties did not preclude employee’s subsequent filing of discrimination lawsuit. The California Court of Appeals reversed the trial court’s dismissal of Plaintiff’s discrimination claim based on the addendum, finding that the language in the release was not sufficiently clear to put plaintiff on notice that he was signing a general release of liability. The context of the release clause was unclear, as it was just one of six paragraphs of an addendum, and it was in the midst of technical language unrelated to the release. Often it is recommended to resolve any potential employment law claims in convert with a workers compensation compromise & release. If an employer wants to resolve all claims with a workers’ compensation settlement, the employer should consider using a long-form release agreement, or at a minimum consulting with an employment law specialist to ensure the goal of a full release will be accomplished. Olive Crest started in 1973 when Dr. Donald and Lois Verleur took in four teenage girls and opened their first home for children in Orange County, CA. Inspired by the olive tree in the front yard and the idea of a family crest, Olive Crest, a name symbolizing “peace family,” was born. Olive Crest has transformed the lives of over 70,000 abused and neglected children. They work tirelessly to meet the individual needs of kids in crisis by providing safe homes, counseling, and education for both youth and parents. Our fist contribution to Olive Crest was creating and donating Easter Baskets with the help from our awesome Office Supervisors and caring MS&A employees! We donated 75 Easter Baskets and crafting supplies for children of all ages! We are sure the SMILES on the children’s faces were priceless! May is “Stuff a Suitcase” month at Olive Crest. We will be donating 40-50 suitcases this month. For more information about Olive Crest please visit http://www.olivecrest.org. At the start of the 1990s, rhino enthusiasts Dave Stirling and Johnny Roberts took themselves on a 'Rhino Scramble' across Africa, raising money to help the fencing of the Aberdare Rhino Sanctuary and meeting a wide range of rhino conservationists along the way. While traveling, they met Rob Brett, Kenyan Rhino Co-ordinator at the time, and started to talk about what they could do for rhinos. Filled with inspiration from their journey, the two returned to the UK and set about raising funds for rhinos in Africa. They started with the infamous and ever-growing London Marathon, roping in friends to run the 26.2 mile course around central London in 1992. 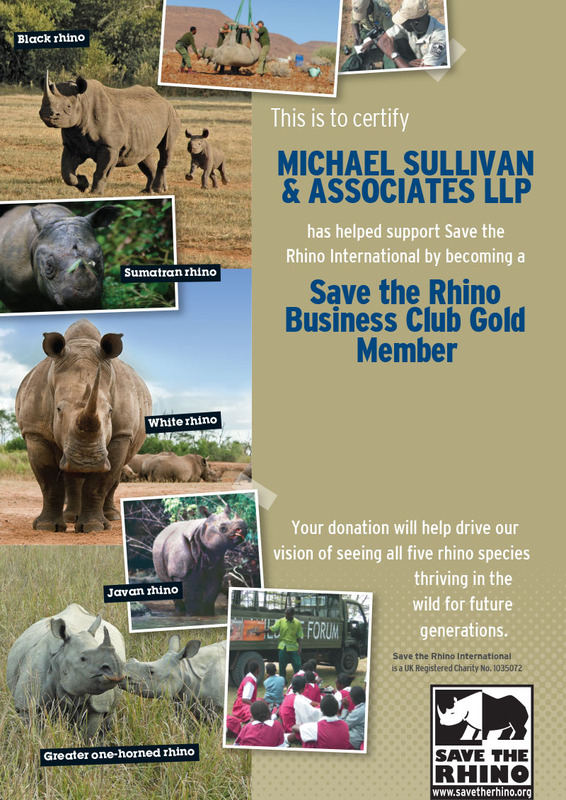 For more information please visit https://www.savetherhino.org. 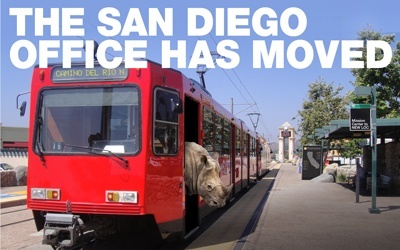 Meet our San Diego attorneys here. Welcome to the Michael Sullivan & Associates blog! This is the place to keep up-to-date with the latest news and information about the Michael Sullivan & Associates law firm. Please take a minute to subscribe to our blog, which will allow you to receive alerts for upcoming posts and learn more about our highly-regarded California Workers’ Compensation practice. The Michael Sullivan & Associates LLP blog is a resource for upcoming events, announcements and news for the California workers' compensation community.